This white paper explains how dynamic checkweighers can significantly improve production processes and how specialized software solutions are key. 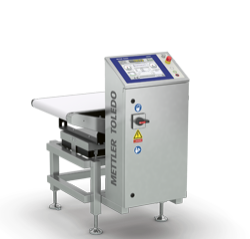 Intelligent checkweighing systems are dependent on the application software and, as each production environment is unique, it's critical the correct software application is chosen. 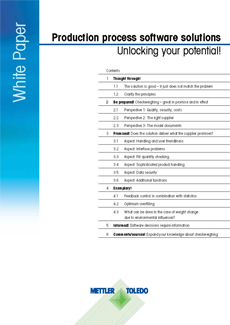 To help manufacturers select the software that best suits their individual needs, this white paper highlights the importance of analyzing their own production requirements and company objectives, as well as actively engaging suppliers in discussion in order to fully exploit the possibilities for optimization. What are the capabilities of modern weighing systems? How to differentiate between value selling and feature selling? Why is the latest software not always necessary? 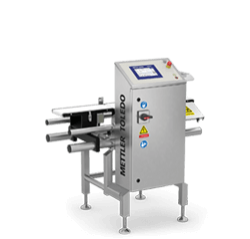 How to ensure flawless checkweigher integration into the production line? What are the advantages of OPC-compatible checkweighers? What benefits does expanded feedback control offer manufacturers? 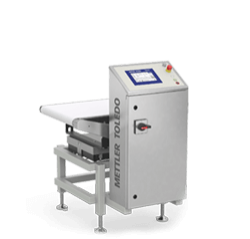 What to look for in a checkweighing system supplier? The white paper includes a quick acid test to help manufacturers identify a high-performing and competent checkweighing supplier. Effective quality assurance systems in production are no longer conceivable without modern checkweighing. Pharmaceutical, chemical or cosmetics, food and beverage, metalworking and the automotive supply industry are just a few of many industry segments who rely on dynamic checkweighing systems. Modern weighing systems have proven themselves in operation to be true "jacks of all trades". Oriented toward the particular product and application, they protect against product defects and recalls, ensure compliance with country-specific metrological guidelines and lower operating costs.